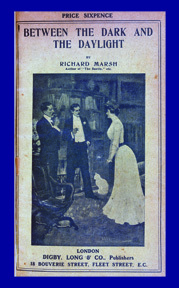 One of Richard Marsh's rarest works, Between the Dark and the Daylight (1902) contains twelve of Marsh's cleverest stories, ranging in theme from slapstick humour to Gothic horror. In "My Aunt's Excursion," the opening story of the volume, an urbanite Londoner leads his provincial aunt and her party of mostly deranged followers on a hilarious and madcap romp across London. In "Exchange is Robbery," Marsh's recurring characters and jewellers to the aristocracy, Messrs. Golden and Ruby, discover they have been the victims of a massive jewel fraud. "The Haunted Chair," one of Marsh's strangest and most unnerving stories of horror, features an old chair at a gentlemen's club, whose owner seems capable of returning from the grave. In "A Relic of the Borgias," an ancient cameo ring appears to possess the power to kill. Other stories, like "Em" and "Nelly," reveal Marsh's softer side as a romantic novelist. This new edition, the first in over a century, features the unabridged text of the original work, along with an introduction by Prof. Paul Fox and a reproduction of the impossibly rare jacket cover of the original six shilling edition.